Best golf shoes for walking that not just fit your feet but also bring value to your game. The shoes you wear to the game can make a lasting difference. You balance your swing and stability on your feet. The shoes should bear the weight and aid your feet in making the turn smoothly. Allow your feet to relax with you. Spiked Golf Shoes Or Spikeless Shoes? 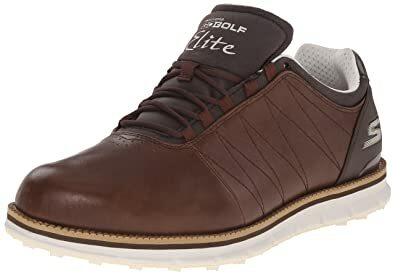 Which Are The Most Comfortable Golf Shoe For Walking ? We found these 5 men’s golf shoes to show the best track record in different golfing conditions. We have selected both spike and spikeless shoes that help you with the showdown in every way. They range across features and prices. 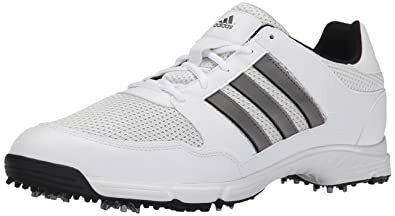 Adidas men’s Tech Response 4.0 golf shoes are cleat in all the right places for supreme stability and hold on the ground. They have 6 cleats, two under the heels and two under the forefoot. Each has 6 rubber spikes built in a low profile manner. They fasten to the wet grass properly for an unerring swing. The EVA insole dissimulates the weight of the golfer comfortably and offers good midsole support. After a lengthy walk, your feet will not feel sore or overworked. The spikes do not add a lot of height to this golfing shoe. The Thintech low-profile technology makes sure you don’t look like you perching awkwardly on spikes. The uppers of the adidas golf shoe are done in mesh and synthetic fabric. The mesh lends it good ventilation and keeps your feet fresh through the tiring walk on the golf course. But water can seep in though the mesh from the wet grass. We suggest you apply your own waterproof coating. The Tech Response 4.0 goes for a classy look with three contrasting stripes on either side. It comes in white, grey and black colors. Needless to say, the black looks gorgeous. These golf shoes have plenty of toe room and they fit properly for people with wide feet. They are moderately priced. The FlexGrid 2.0 upper immediately draws your eyes. This is a web of flexible material that covers the upper. It provides ample flexibility in the area while making for a snug fit. This shoe feels fluid while twisting the feet during a swing. The FJ Hyperflex golf shoes use Tornado cleats by Softspokes for solid traction on wet ground and slopes. Their waterproof nature makes them invaluable during winters and summer showers. 4 cleats on the sole make provide unrivalled support for walking. The Fine Tune Foam cushioning offsets the feeling of spike effectively. Your feet feel comfortable in spite the drastic spikes. These golf shoes are waterproof in spite of the sufficient air circulation. They will remain so for two years even with regular use. The sole has 7 spiked cleats that provide stabilized hold on any type of golf course in any climate. The outsole is annealed with carbon fiber and TPU shank which lends it excellent arch support without contributing too much to the weight. The Nike Power Transfer Zone technology smoothens the transition from backswing to impact. It helps your feet manage the weight transfer and balance during the swing. These golf shoes have flywire saddle for support. The Lunarlon cushioning and contoured sockliner have good shock- absorption capabilities. Lunar Control II is waterproof. The tongue is mesh and provides good ventilation. Nike has stayed minimalistic in its design. The outsole carries a contrasting color. They all have the trademark Nike Swoosh. 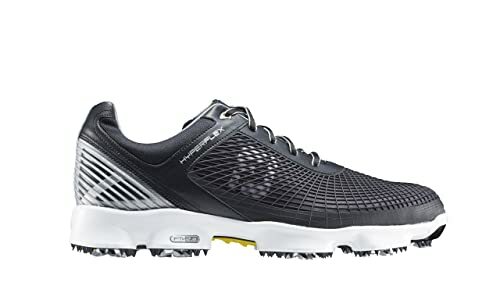 The Skechers Performance men’s go Golf Tour Elite golf shoes are spikeless footwear. These shoes are best for golfers who have issues like arthritis or joint-related illnesses. Spiked shoes can cause further inflammation in the joints. These feel much better while walking on the expansive golf course. These are premium shoes with leather on the uppers. The brown model of the shoes looks fantastic, on and off the course. The spikeless cleats give you moderate traction. You might slip once or twice on wet and slippery grass. They can be used to wear and walk on any surface. These golf shoes are very versatile in avenues of their use. Because of the leather build, the Golf Tour Elite is waterproof. Seam-sealed joints do not let the water enter at any cost. Even the padded tongue provides protection against an influx of water. The cushioned sole and the TPU shank provide proper support to your arch. 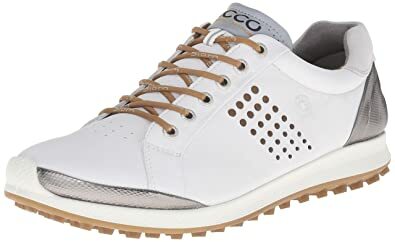 ECCO men’s Biom Hybrid 2 are the best golf shoes for a budding young golfer. They have the youthful look to go with their hi-end build. ECCO has used premium yak leather to design the uppers. This makes the shoes last long enough to justify their price. These golf shoes use the Hydromax technology for resistance against the weather. You can wear them during rains and expect your feet to remain dry. The same technology also fights against sweat. The shoes feel light and airy. The moisture from perspiration is wicked off well. It also employs an anti-stain formula to keep the shoes looking new. The insole of this golf shoe has been designed to avoid stray movement of feet during the swing. Such movements can destabilize your movement and cause you to miss the right impact. Women’s shoes are very different from men’s shoes. The women’s golf shoes are wide in the forefoot area and narrower in the heel area to conform to the anatomy of women’s feet. They have a softer midsole to deal with the lower average weight of women. The best golf shoes for women take these differences into account along with the demands of golf. The shoe is made of canvas. That contributes to its low weight and breathability. It is easy on feet as you go across the vast expanse of the golf course. The entire body of these golf shoes is lined with Lunarlon drop-in sock liner. This cushion envelopes your feet in a protective manner. The Lunar Duet runs true to its size. But initially it may seem a little too snug. It opens up halfway through the first round. This is a spikeless golf shoe. Its rubber sole has special traction lugs across the pressure line of the feet. This offsets the pronation of women’s feet. The upper of these shoes is made completely of mesh. You can almost see through the first layer which gives it its unique translucent look. The mesh construction ensures that these golf shoes are breathable through your walk on the golf course. Hot and sweaty feet can affect your performance adversely. The uppers are also coated with a debris guard so that the dirt from the golf course doesn’t exploit the mesh and its ventilation. These golf shoes use Callaway’s best-selling lightweight ethylene vinyl acetate sole. 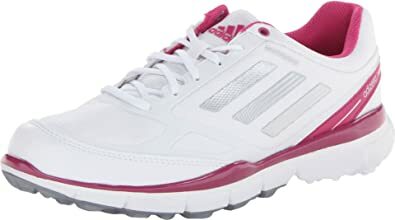 Adidas women’s Adizero Sport II golf shoes are highly technical footwear. They employ all sorts of ergonomic techniques for a comfortable fit. They use uber-lightweight mesh upper. The shoe has proper air circulation inside due to the breathable upper. Your feet do not sweat even with the constant walking and club swinging. The mesh of these golf shoes is protected by climaproof layer. They are waterproof. You can play in wet grass on dewy mornings without soaking your socks. The midsole of the shoes provide excellent arch support. Your feet do not end up fatigued after the long walk. The adiwear outsole of these golf shoes has some spikeless traction lugs along the pressure curve of the feet. These provide lateral stability while taking a swing especially on slopes. The lugs also make sure that the sole does not wear off quickly. They are abrasion resistant themselves and stay put with walking on any surface. The Adizero golf shoes are fairly versatile. You can wear them for you day-to-day activities as well. Skechers is making a mark amongst the top brands of shoes. Their women’s Go Golf 2 Lynx golf shoes are lightweight and literally a delight for your feet. This is a leather and textile shoe. The upper is mostly made of mesh. This provides excellent ventilation for those hot and stuffy days on the course. It has a Resalyte midsole. This is an injection molded structure with memory retention. It helps the shoe tolerate the impact of different pressures. The slanted outsole offsets pronation and allows you to walk fast and properly. It complements the right gait of walking. The fabric lining inside the shoes keeps the feet engulfed in a soft surface. There’s a spikeless sole on these golf shoes. It has lugs that allow them to gain traction on slippery ground. 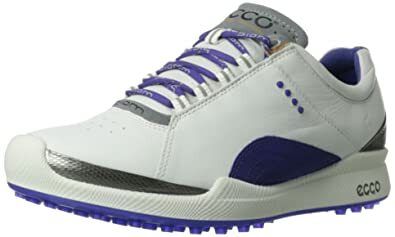 The ECCO women’s Biom Hybrid II golf shoes are a snazzy pair. They combine some cool colors with top-notch construction for the golf course. They look and cost premium. These golf shoes are made of hydromax leather. The upper looks beautifully crafted. There’s a hint of metallic finish around the toebox and the ankle shaft. The anatomical footbed is ergonomically designed to embed your feet. They provide exceptional support to the feet and absorb the shock from uneven terrains. The insoles of these golf shoes are removable. You can swap them for custom orthotics. There are spikeless cleats on the sole which gives you good grip even over wet grass. They can’t compete with spiked cleats but they do decently well. They fit both narrow and wide feet well. Yes, why can’t we wear normal tennis shoes to the golf course? For the same reason you don’t wear running shoes for hiking or sneakers to a skating rink. If you were to take a golf swing barefeet, you would realize that there are a lot of mechanics involving your feet in the action. Since you will be standing still for the shots, the shoes must provide good balance. This is done by broadening the shoe base. Spikes under the shoe base also give you a better grip while taking the swing. They should be comfortable since you must walk 4-6 miles for a game. They must have a flexible upper so that your feet move freely on a difficult terrain. This makes a difference when you are trying to scoop the ball off an awkward slope. There’s no way a tennis shoe can do all that. Golf shoes have better, streamlined design that aims at keeping the feet rested but alert on the course. Small design enhancements in insole, outsole, upper, ankle shaft etc. subtly differentiate them from regular shoes. Do you play during winter or monsoon? There’s a high chance that the golf course will be wet during these times and will require the extra grip. As stable as spikeless shoes are, they cannot give you the same lateral support as the spiked ones. But the lug pattern has improved in recent models of spikeless shoes to the extent that pro golfers are using them. So you have to check the stability for your feet to get a clear idea. How versatile do you need your shoes to be? If you intend to use the same shoes to drive to golf course, play, go for after-game celebrations and even go to work, then spiked shoes can be a problem. The spikes can wear off. While walking they can cause the joints to overwork. Spikeless shoes are better suited for extensive walking. They can even be worn to work, provided the lug pattern doesn’t get damaged on concrete walkways. The lines between comfort and traction of both types of golf shoes are increasingly blurring. Still, we would suggest that the beginners stick to spiked shoes on the course. For other players, having a pair each of spiked and spikeless shoes would be pertinent. You can cycle these shoes between seasons/course situations. The rotation will also help each pair have a longer life. Comfort: For shoes to truly partner in your swing, they must be comfortable. All fancy features go out the window if they don’t treat your feet well. This depends on the width of the toebox, the quality of insole, the support and torsion of the forefoot etc.. Although comfort of a shoe is subjective, the best golf shoes covered here have found acceptance amongst majority of golfers. Stability, torsion and traction: The best golf shoes provide reasonable traction on any terrain. The golfer exerts pressure on her/his feet. So the shoes must be up for handling the weight. Better traction and proper distribution of weight ensure stability. Since golfers are required to rotate their feet, the forefoot must have enough torsion to carry out this movement. Style: Golf is an elite sport. Most golfers strive to look smart on the course. If you have invested in the best golf pants, golf shirts, golf shorts, etc., the best golf shoes are the right footwear to go with them. Budget: Shoes can be a costly affair. Sales personnel can fast-talk you into buying exorbitantly-priced shoes based on scientific-sounding terms. Do your research and use this buying guide as a reference to assess what you really need. Odds are our top 5 golf shoes for men/women will appeal to you. Golf shoes play an important role in walking you up to that tournament trophy you so desire. We handpicked the best ones for men and women keeping in mind the tedious requirements of the game. The adidas men’s Tech Response 4.0 sports strategic placement of spiked cleats for extra traction on the rainy days. It is a highly ventilated shoe that has a spacious toebox for wide feet. The simple design looks sophisticated in the mono colors and statement adidas stripes. The Nike women’s Luna duet golf shoes sport a canvas construction. They are lined completely with a soft liner which makes them heavenly to wear. The spikeless cleated soles offer good traction and support. These are pretty versatile for off-course use as well. All the shoes covered in our best golf shoes for walking list have proven their mettle on various turfs. They minimize the probability of errors due to loss of balance or stability.